Keynote speaker Dr. Bill Silver kicked off the second annual North Coast Wine & Weed Symposium last week by conjuring a vision of long ago: picture a group of teens hiding out in a basement in New England on a snowy day in the 1980s, sipping some rotgut called Wild Irish Rose with cream soda, and furtively blowing clouds of Acapulco Gold out the window (sub in Bartles & Jaymes wine coolers and a Thai stick, and it sounds like a foggy evening in the North Bay long ago). It wouldn't have occurred to one of those teens, Silver tells the crowd, that one day he would smoothly, and quite legally, shift jobs almost overnight from the wine business to the weed business. "There are no words to describe what is happening right now."
. . . um, what was the question again? The obvious question has an easy answer, as it turns out. Will there be weed in my wine? Not at this time. Wineries, which are federally regulated, will not touch the stuff. They may, however, co-brand with cannabis companies to offer products to their wine club lists, which panelists in the seminar on cannabis opportunities for the wine industry suggested was a tantalizing prospect for marketing professionals in the wine business. They've got wineries lined up in the pipeline, several say. But here's the thing: they're all waiting for the other guy to go first. Other presenters, like Brian Applegarth, founder of Emerald County Tours, enthused about the tourism potential of historic growing regions and other wine-like weed events like food pairings. Several exhibitors, including the Solful dispensary in Sebastopol, made the case for weed-aroma appreciation. It's a bit of a head trip, if you will, to see wine glasses full of buds in a corporate hotel lobby, but that much is legal, after all, in 2018—just no samples with active ingredients. 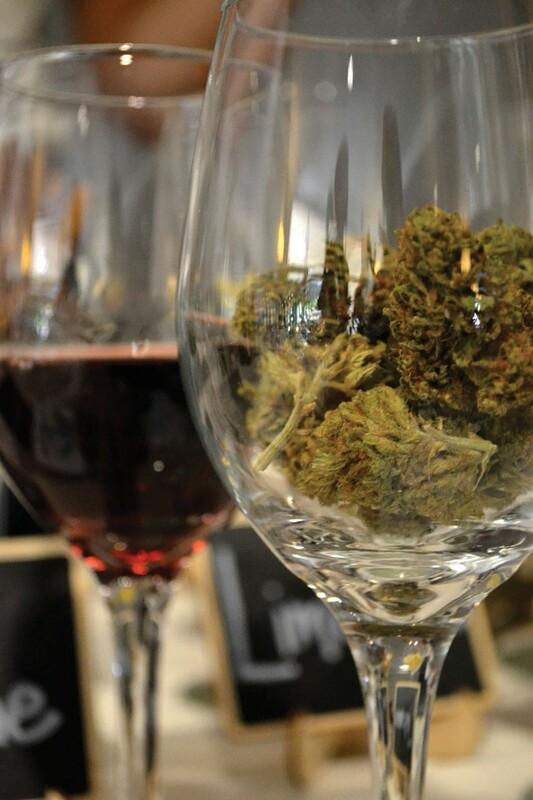 It will be a while before you hear someone cry out, "Sommelier, there's weed in my wine!"